And for good reason. One of, if not the very best, reasons is discussed here. Americans are not stupid. If the members of the two houses of Congress were genuinely serving the citizens’ interests – instead of their own interests often, if not exclusively, at least as a group – there is no reason why their popularity would be, as it is, much lower than that of the other two branches of the federal government. Let’s begin with the basics: people choose their profession – the business they engage in as a career to earn their living – for all kinds of reasons. There is only one reason why people choose to become career politicians: because they want to acquire and exercise power over other people, while invariably claiming to be performing a noble “public service.” They may genuinely believe their intentions are truly public-spirited, and that they can help people in that capacity. But they also believe that obtaining that power over others is necessary to serve their intentions, however benign they think they are. And ultimately, like anyone else pursuing their chosen vocation, they want to use that power to make the most money they can, even if they want to do so honestly, and even if they have to wait until leaving office (many senators become very rich mysteriously while still in office) to make the big bucks. For various reasons, including the fact that they presume to write all the laws which affect the outcome of elections, for some time now, both houses of Congress have been populated by people who almost all become professional, career politicians once they win office, even if they were not so previously. Most of them are lawyers, and all of them have the promise of fabulously lucrative work as lawyers or lobbyists ahead of them after they leave Congress – but only if they play the political game and follow the directives of the leaders of their party (and thereby support the entire Washington establishment — the only actual bi-partisan force in that city) while in Congress. This article is about a particular corrupt activity of the U.S. Senate and its members. Specifically, it is about how they have long used the existence of the so-called Filibuster rule to usurp power (from us), at the direct expense of our liberty and prosperity. And that particular corrupt activity of the Senate is now, as it has been doing for well over a century, forcing the nation to live under laws enacted by former officeholders, many of whom lost re-election precisely because of those very laws which the public, at least now, detests – and wants repealed. It is the single greatest “legal” impediment to good new laws, and to repealing anything. The very fact that Senators, with only the rarest exceptions, end up serving primarily their own interests (as I show below, if you doubted it), as a direct result of all the incentives imposed on them by the (written and unwritten) rules they have themselves created for their institution itself, even if that was not their original intent in running for office (anyone who doesn’t play that Establishment game is invariably reviled by the others in the Senate), is the very definition of corruption, their own and the Senate’s as an institution. that it is a legally-permitted/now-required rule and that we the citizens have no choice but to put up with it and the particular, corrupt usurpation it facilitates. All of these claims are, quite simply, lies. And they all know it. As their sole arguments (they have no others) claiming to support the Filibuster rule, present and former senators have given self-admiring speeches and written articles claiming how sacred it is as a hallowed, ancient tradition, falsely, as shown below, alleged by them to have been created by the founders (often quoting/misrepresenting a purported statement to George Washington by Thomas Jefferson regarding the role of the Senate as the federal power center of the states, which statement, if made at all, which is highly doubtful, preceded the Filibuster rule’s existence). As clearly shown below, these evidence-free arguments are patently bogus as a matter of both history and Constitutional law. 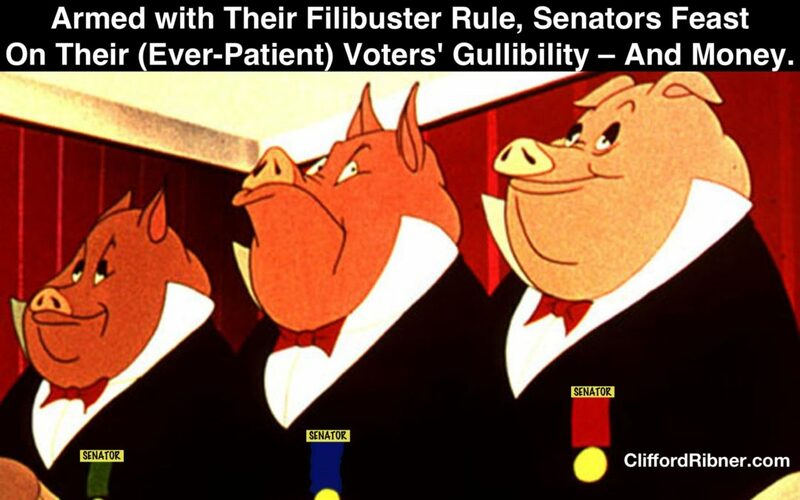 The Filibuster rule does nothing but fuel self-serving corruption in the Senate, is structurally incapable of ever providing any advantage to the voting citizenry (since its very purpose is to defeat the legislative preferences of a majority of the citizens, including even a landslide-magnitude majority of up to 59.9%) and, as shown here, is clearly unconstitutional for multiple reasons. Please indulge me as I discuss some slightly technical, but hugely-important, legal/Constitutional textual matters. Because, as you will see after that particular discussion here, they affect you and all of us profoundly in our real lives and are far from mere theoretical, legal stuff. The textually-limiting prepositional phrase there “of its Proceedings,” together with, the entire remainder of the Constitution — whose very purpose is to expressly define and limit all substantive powers of each House of Congress, of both of them, and of the entire United States government — clearly limits the permissible scope of any such Rule-making power to non-substantive, internal housekeeping matters of such Houses and, even among them, to only those matters not specifically addressed, expressly or by necessary implication, elsewhere in the Constitution. The plain purpose of that rule-making power limits its scope to the internal operations of each such House, authorizing nothing which affects anyone – the citizens, or the laws we are subject to – outside each such House. Specifically, nothing in that Rule-authorizing provision permits either such House to alter in any manner any substantive, nor any substantively-significant procedural, provision of the Constitution. Obvious examples of the latter type of procedural rules for which any such “Rules” are not thereby permitted would plainly be: reducing, or increasing — say, from the Constitutionally-specified 60% up to 90% — any Constitutionally-explicit supermajority voting requirements, and altering any procedures Constitutionally-specified for Congressional office elections, for impeachment, and for the enactment of actual legislation. Since the plain text of the Constitution itself expressly addresses each of those just-enumerated, substantively-important procedural matters, any Congressional attempt to invoke their textually-very-limited “rule”-making as supposed authorization to alter any of them would plainly violate both the Constitutional provision so altered/violated itself, and Constitution Article V which expressly provides for the exclusive means of amending the Constitution in any manner. The fact that a particular rule, such as the Filibuster rule, has existed for a long time – and, accordingly, is supposedly now supported by “precedent” – does not make it Constitutional. Otherwise the Constitution would be a dead letter once any violation of it occurs, since the violation itself would thereby create a precedent supposedly automatically justifying the violation itself – a facially nonsensical notion with no basis in the Constitution’s Article V, logic nor in common sense. By explicitly providing both for particular supermajority votes, and for the precise, percentage supermajorities required, for the passage of Congressional votes for particular, named matters, the Constitution similarly specifies – by necessary, though tacit, implication – that all other Congressional votes require a simple majority of the members of each House present to succeed in passing such (provided they constitute a quorum), and that no mere housekeeping rule is permitted to alter a matter of such enormous consequence. And that tacit, but necessarily-implicit, majority-rule for most of the votes has always been well understood as what the Constitution indeed requires – and is precisely what the Filibuster rule, in its convoluted, deliberately-obfuscatory manner, purports to change. its inherently-corrupt, self-serving — to those senators alone — consequences. It is that particular, universal, supermajority-voting requirement which I am here calling, as it has from time to time been called, the Filibuster, whose immediate repeal I am here demanding. As mentioned above, Article I of the Constitution, which provides for all of the fundamental attributes of both Houses of Congress (e.g., all their membership requirements, and their powers – precluding all others not enumerated therein) explicitly requires some supermajority votes of each House, but only for the passage of certain carefully-specified actions (i.e., to expel a member, to adopt a treaty, to remove an impeached judge or executive officer) and, since it does so only for those very limited instances, it clearly requires mere majorities to vote on all other matters not so specified. And that is precisely what all voting-passage requirements have always been in the House of Representatives. That was also the case for all the earliest terms of the Senate – until 1806. It was in that year that the then-Vice President who, in that office, Constitutionally presided over the Senate, Aaron Burr single-handedly initiated this radical “rule”-created Constitutional change. Not incidentally, Burr was both (1) the duel-killer (it constitutes homicide, at law) of the truly great patriot Alexander Hamilton, and (2) the (unconvicted on a technicality) traitor who conducted his own, personal, self-promoting foreign policy favoring Mexico, with a private army, actively seeking the dismemberment of the United States! Quite simply, one day in 1806 while presiding over the Senate, Burr suggested (carelessly? subversively? No one knows) new language for the Senate’s “Rules of Its Proceedings” which would have the practical effect of instituting the universal (except for changes to those “Rules” themselves) 60-vote requirement whose technical features have varied over the years, but which in substance has continued to remain intact to this day. Article I Section 3 of the Constitution explicitly provides, “each Senator shall have one Vote.” Interestingly, the Constitution has no similar provision for Representatives in the House. 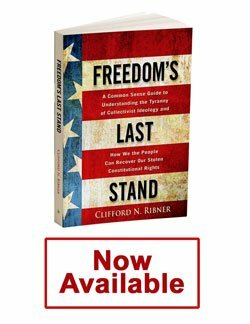 Accordingly, the Constitution could not be clearer: In addition to its above-mentioned, tacit and, necessarily-implicit, requirement of normally requiring simple majorities alone for votes passing, under no circumstance should any single senator be accorded greater voting power than any other senator (except in the very-few, mandatory super-majority instances enumerated in the Constitution itself). With respect to the matter of such equal voting power among senators, it is apparent that, in the case of any vote requiring a supermajority, any individual senator among those in the minority with respect to such a vote effectively indeed has greater voting power than any senator in the majority, since the measure cannot pass over the veto of those necessarily-fewer minority senators. Since, as shown above, the Constitution is explicit with respect to which very-few, enumerated measures actually require super-majorities for passage and, for the reasons shown above, tacitly also requires simple majority-only votes on all other matters, and explicitly directs that no senator be accorded greater voting power than any other, only a duly-enacted Constitutional amendment would permit doing what the Filibuster rule does — adding additional (i.e., virtually all) measures to those actually enumerated in the Constitution requiring (or permitting) such super-majorities. As mentioned above, Article V of the Constitution provides the exclusive methods for amending it, none of which include passage of a purported amendment by a mere majority of the Senate, as always has been the only requirement for passage of any Senate housekeeping rule. For all these reasons, the Filibuster rule in all its various, confusing forms over the years is and has always been unconstitutional since it violates multiple explicit and necessarily-implicit, tacit provisions of the Constitution and, as the real-life example of the Senate’s unilaterally preventing fulfilling the public’s demand that Obamacare be repealed in a manner genuinely approved by a majority of the citizenry, rather than in a jerry-built manner to conform with the Filibuster rule’s demands ,as discussed below, plainly shows that rule is no mere housekeeping procedural rule, but rather could not be more substantive and far-reaching in its effects. Briefly, these real-life, practical effects (In addition to its being unconstitutional) of the Filibuster rule are both clearly anti-democratic – necessarily defeating the clear will, on matters of enormous personal importance, of a majority of Americans and of the senators who represent their states (or purport to) – and profoundly corrupt and corrupting. First regarding the second such consequence – legislative corruption: the founders were keenly aware of the potential for corruption in both laws and the legislative process (euphemistically called sausage-making). Clear proof of this fact is found in the Declaration of Independence itself which enumerates multiple acts of Parliamentary corruption against the interests of the (nonvoting) British citizens in the then-13 Colonies, for the benefit of particular interests among British voters (and businesses, such as tea companies, bribing Parliament members for laws benefiting them at our expense). (2) It, perhaps counterintuitively, provides multiple special benefits to senators whose party is in the minority. These go well beyond simply permitting them to veto any new legislation they don’t agree to, although that is obviously an extraordinary benefit in itself (and forbidden by the plain text of the Constitution since it gives them greater voting power than senators in the majority). But it goes beyond that, permitting them to extract particular extra benefits as payoffs so that they (supposedly reluctantly) end up providing necessary votes to pass particular legislation the majority wants. (3) And the majority party derives multiple, corrupt benefits from all this: first, this arrangement provides a particular incentive for the minority party to want to remain the minority party (does that sound like the Republican Party’s modus vivendi since the 1920s – even when it has been in the majority? ): Its elected members can secure their own constant reelection in their states by teaming up with the majority party (which always has the incentive to do this as well) to pass legislation benefiting incumbency in office (pork and “campaign finance” legislation, e.g., which make it extremely difficult for incumbents to be challenged in primaries, which is why they almost always win those). Each particular senator derives his own personal benefits (power, money, incumbency) if he remains in office – even if his party is fundamentally ineffectual politically as a minority party. (4) All incumbent members of both the majority party and the minority party can use the inevitable and constant difficulty of overcoming the need for 60 votes as an excuse to their constituents for failing to deliver on policies which their constituents who elected them want, and including particular policies they promised to enact while running (policies whose enactment might upset the status quo, which status quo always benefits the incumbent politicians at the expense of all voters), while using the logrolling power, which is greatly enhanced by that rule, to deliver policy-irrelevant, or policy-defeating, pork of various kinds in their home districts – corrupt, taxpayer-funded, expensive pork, which provides an additional means of securing their incumbency benefits since challengers can’t do that until they get elected. Nothing so perfectly illustrates all of these features of the scam as the particular activity in Congress which they have represented to the public as their effort to “repeal and replace” Obamacare. Ever since Obamacare was passed in 2010, at a time when Republicans were such a tiny minority they could not stop it, Republicans have been running for office promising to repeal it. Their constituents have grown increasingly angry after the Republicans won a majority first in Congress in 2010 and failed to use the power of the purse, which they had without needing to be a majority in both houses of Congress and even though Obama was in the White House, to functionally eliminate Obamacare, even if they could not formally repeal it yet. They did not do so, claiming it would be politically destructive to use the power of the purse – a Constitutionally-provided power everyone knows they have. Republican constituents grew increasingly restive after Republicans then won the Senate in 2014 – and again did nothing with any substantive effect to eliminate Obama- care. After the 2016 election, Republicans nominally control the White House and both houses of Congress; but again, they still claim they have insufficient power to enact legislation attractive to their constituents regarding Obamacare – always pointing to “the need for 60 votes in the Senate” as the ready excuse for crafting inadequate and unpopular proposed legislation in the inherently-corrupt manner required by the Filibuster rule, legislation which inevitably fails to please their voters. With a simple majority vote, they could repeal the Filibuster rule – as they should since it is unconstitutional anyway — and pass whatever Obamacare repeal and replacement law they and their constituents actually want. So it is transparent that their continuing to rely on the Filibuster rule as a basis for not enacting legislation their constituents actually want with respect to healthcare laws is a continuation of the scam. Any legislation they pass – particularly with an openly hostile Democratic Party dedicated to resisting anything the Republicans want, in the minority – necessarily must result in the kind of completely-unnecessary ”sausage-made” corrupt mess guaranteed by the Filibuster rule. It remains to be seen if Donald Trump, the only genuine non-politician who, because of his personal wealth, owes nothing to anyone, can force the hand of his fellow Republican party members in the Senate (many of whom detest him because of the threat he poses to the administrative state’s continued life, which they all secretly desire, just like the Democrats, because it gives them power over tax money and the citizenry and the promise of personal money while in office and thereafter) to abandon the Filibuster rule and enact legislation which does not require compliance with the scams described above to pass it, legislation which could be passed by simple majorities in both houses and which he would be happy to sign.